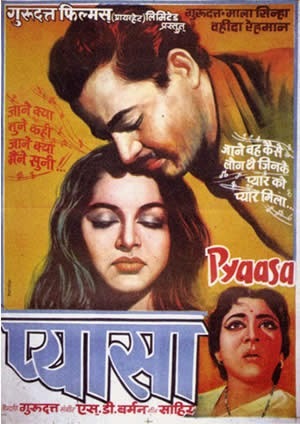 To mention the word “review” for a movie like “Pyaasa” would not be giving due respect to this masterpiece. Considered one of the greatest movies of Indian cinema, Pyaasa combines love, pain, deceit and the double standards of society with a perfection that hardly any movie has done. 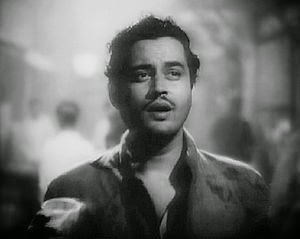 It is said that Guru Dutt was a director ahead of his times. And when you watch this movie, you marvel at the thought process of this genius back then in 1957! The movie, considered by many to be based on real life story of the famous lyricist Sahir Ludhianvi revolves around a young man Vijay (Guru Dutt) who is gifted with the art of poetry. However, in the world of opportunism and malice, his honesty has hardly any takers. So, his talent goes unnoticed and everyone, including his real brothers discard him as a penniless loser. Vijay’s principles and self respect however, are unfazed by hunger and rejection. Harbouring the dream of being published someday, he comes in contact with Mr. Ghosh (Rehman), the owner of a large publishing house. He is unaware that Rehman is only a selfish man who obliged him to know the secret of his past. As if rebuke and rejection was not enough for Vijay, destiny plays another cruel game with Vijay. His college sweetheart Meena (Mala Sinha) who had left him to enjoy marital bliss with a well settled Mr. Ghosh comes face to face with him. With old love coming knocking on the door, things get even more complicated with Mr. Ghosh discovering their secret and Vijay losing his job. When the world uses Vijay for their vested interests, leaving him with pain in return, it is only a prostitute Gulabo (Waheeda Rehman) who stands by him through thick and thin. Smitten by his poetry and gentleman attitude, Gulabo proves her true love by sacrificing her entire money to fulfil his dream of being published. Vijay’s poetry does eventually make him a favourite with poetry lovers however, just like the distance between the cup and the lip, Vijay too is unable to get his due credit, thanks to the not so good gestures by Mr. Ghosh, his brothers and some selfish friends. While the publisher makes a killing with Vijay’s poems in print, the real hero is parked away in a mental asylum. Whether Vijay is able to get his due and whether he finally gets peace in the world of fake promises and double standards is for you to see. 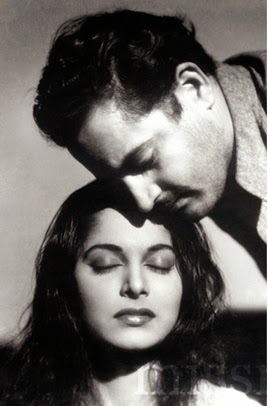 The film has power packed performances by Guru Dutt, Waheeda Rehman, Mala Sinha, Rehman and Johny Walker. 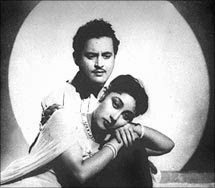 Guru Dutt, the king of tragedy and romance conveys such intense emotions effortlessly that you simply relish each and every scene. Waheeda Rehman portrays the transition beautifully from a charming prostitute to the woman seeking true love and respect. Notice both sides in these songs. Mala Sinha aptly essays the role of a weak and helpless lover who is stuck between the concern for her love and the bindings of the society. Rehman, well known for his negative roles during those times, does full justice to the role of a mean and cunning man who masks his malicious intensions under layers of sophistication. While I had always thought Johny Walker’s role in the movie was just about the song, Sar Jo Tera Chakraye, I figured that he is used as an SOS vehicle in the story when al the odds are against Vijay. Besides adding the humour quotient, he is credited with bringing an important twist to the story. While I have heard the songs many a times since I was a kid, I fell in love all over again with them when I saw the movie. The songs are brimming with emotions and I wish we had lyricists and composers like we had back then. The post would be incomplete without a mention of the lyricist, Sahir Ludhianvi. Though there are no words to describe the beauty with which he has penned down the songs, it is best recommended to listen and reflect upon the message he is trying to give in each song. Overall, Pyaasa needs no endorsement to prove itself. For those of you who look at old Indian cinema with tinted glasses, such masterpieces are just not to be missed! Did you know the role essayed by Guru Dutt was originally offered to Dilip Kumar, but he declined. Also, Nargis Dutt and Madhubala were offered the roles played by Mala Sinha and Waheeda Rehman respectively. The movie became a major commercial hit. Great review of an equally great film... good job!!! The new face of Diwali!